The straight arm dumbbell floor pullovers weight bearing exercise is an Active level strength exercise. In this video I will demonstrate dumbbell pullover technique. Bones of the wrist and spine. The following are the instructions to complete the straight arm dumbbell floor pullovers exercise. 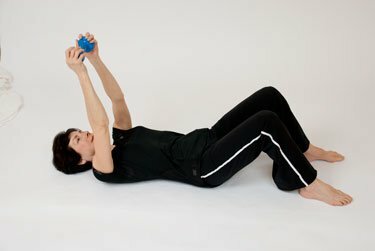 Note that I will demonstrate proper dumbbell pullover technique to avoid injury and increase the effectiveness of this exercise. This is one of the Active level strength exercises in Exercise for Better Bones. When you do the straight arm dumbbell floor pullovers it will be one of the first times you’re going to be holding a weight over your head. If you haven’t invested yet in weight training gloves — you can also use well-fitting cycling gloves — now would be a good time to do so. That extra grip is always really nice with the weight sitting right over your head. Another important tip is how to safely retrieve a weight that you’re going to be using from the floor position. You want to get down onto your side. Then the top arm is going to grasp the weight. Then you’re going to take it between the hands and turn flat onto your back. At this point, we’re going to be sharing the weight. Hands on either side of the dumbbell, bring the dumbbell to sit straight up overhead. Straight line over from the hands right over the shoulders. 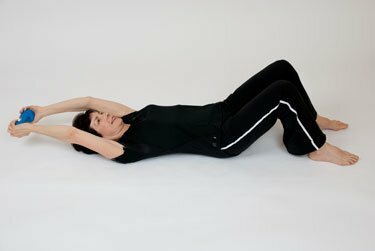 Your feet and your knees are still hip-width apart, and this is where, again, you’re going to use your abdominals to keep that nice little neutral spinal position in your low back. Slowly, gently exhaling, tummy tight as your bring the weight straight overhead. This is one exercise that you definitely want to start with a lighter weight and gradually build up, even within a session, just to ensure that you are picking a weight that is not too challenging for you if you’re not sure of what your weight level is. Have a spotter next to you as you do your dumbbell floor pullovers. A spotter is someone who will have their hands sitting right under that weight — just in case you have a hard time bringing it back. So again, breath in, straight overhead hands come, arms right up by your ears, abdominals tight. When you’re done your set, bring the weight back. You’re going to again take the far arm to bring the weight back onto the floor. And that’s it for the straight arm dumbbell floor pullovers. I have a spinal cord injury where the spine was severed and a metal was inserted to connect the spine…I have regained feeling in the entire body as a result of physical therapy. Congratulations on your recovery. What a wonderful gift you have been given. I used to work in spinal cord rehabilitation. Your question is good I can tell you that “The oblique twister” is not part of my program but I would avoid this one. The pullover should be safe but if you were told not to do any overhead resistance training or any spinal extension then I would avoid it. The best person(s) to ask are the physiotherapist(s) that got you through the rehab. The level of your break or how many segments of your spine are immobilized to protect the original fracture site are also a consideration.